Joseph Palmer (Palmieri) was the youngest of 2 sons from an Italian family. 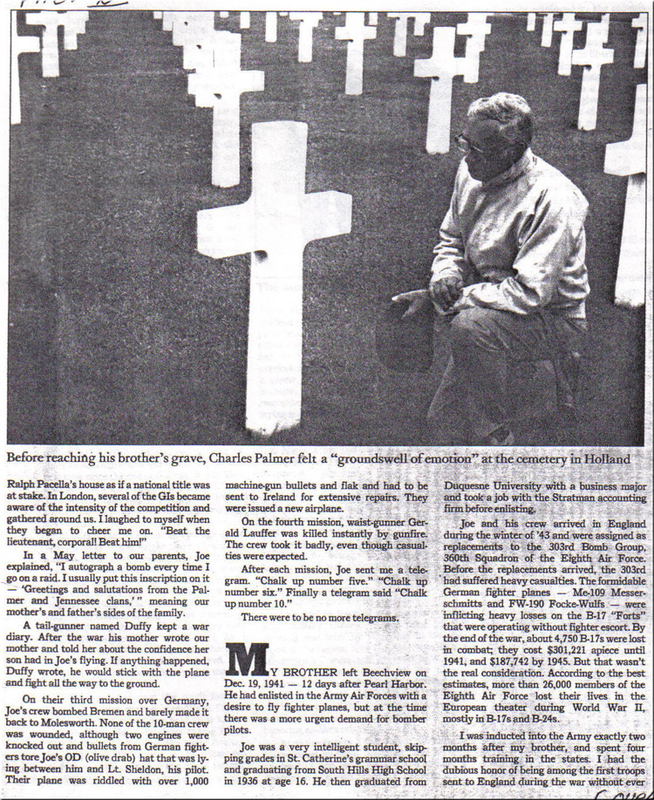 His last name was changed by an immigration clerk from Palmieri into Palmer. 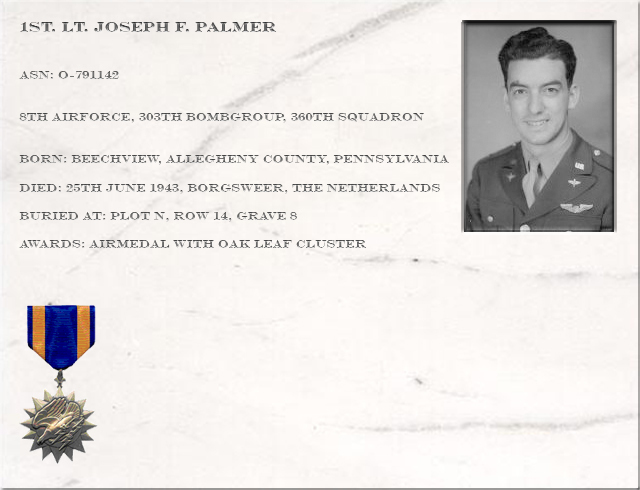 The Palmer family lived in Beechview, Allegheny county, PA. Joseph, or Joe, was a smart kid he skipped some grades in grammar school and he graduated from high school at age 16. He then graduated from Duquesne University with a business major and took a job with the Stratman accounting firm. But not long after all of this, on the 19th of December 1941, 12 days after the Pearl Harbor attack, Joe Palmer enlisted. He joined the airforce with a desire to fly fighterplanes, but the demand for bomber pilots was more urgent. 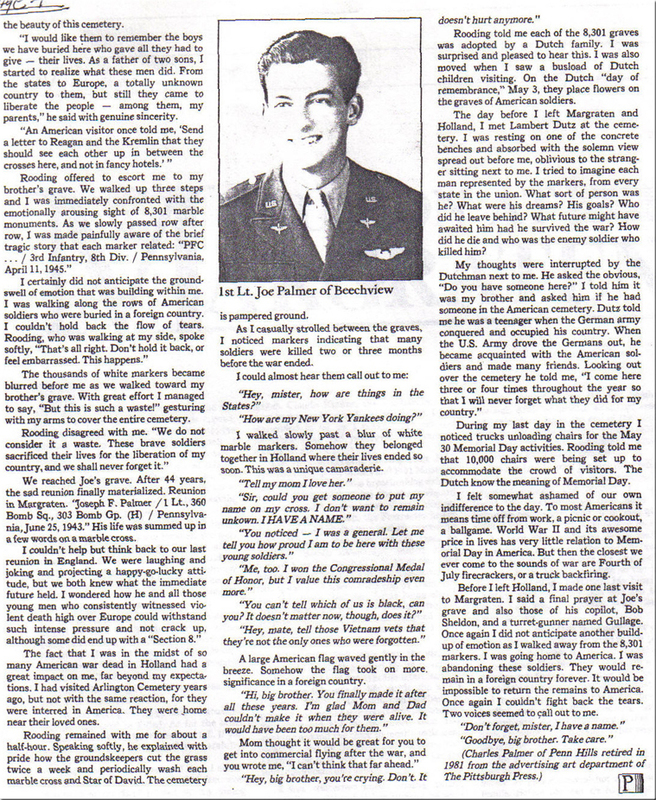 So he became a pilot of a B17 "Flying Fortress". After their training in the US, Joe Palmer and his crew departed to England in the winter of 1942. They were replacements for the 360th squadron, 303rd bomb group. Their plane a B17f, serialnumber 42-5390 had the name "Avenger". 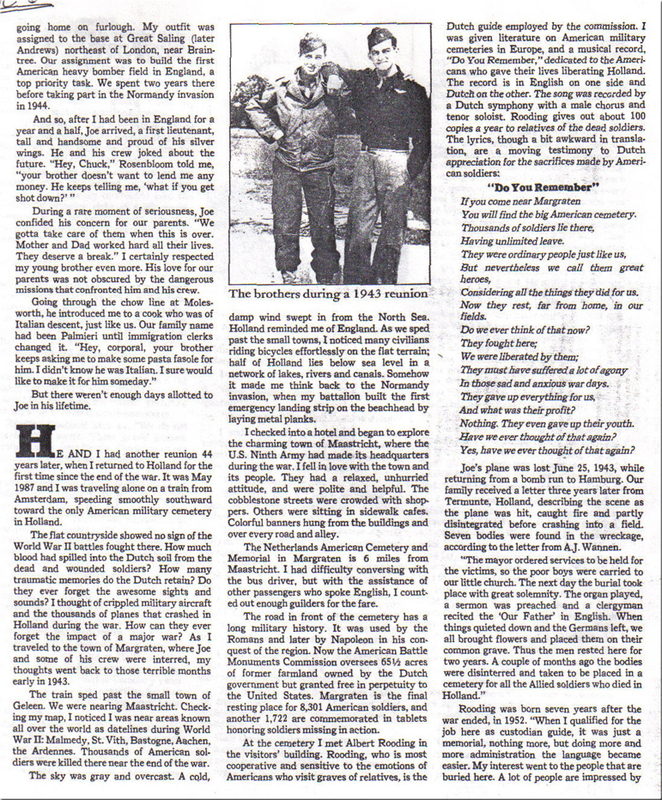 The 303rd bomb group "Hell's Angels" were founded on the 28th of January 1942 in Savannah, GA and it was activated on February 3, 1942 on Pendletonfield, Pendleton, OR. The crew combat training took place at Alamogordo Air Base, NM, and on Biggs Field, TX. On 23th of August 1942 the ground echelon departed to Molesworth, Engeland. The planes and flightcrews followed in October. The 303rd bomb group had 4 squadrons: 358th, 359th, 360th en 427th squadron. On the 17th of November 1942 the 303rd bomb group flew it's first mission to the U-boat docks of St. Nazaire, but due to bad weather above the target they couldn't drop their bombs and returned to base. This was the first of 363 missions in which they dropped 26346 tons of bombs and made 10721 sorties. They lost 210 planes and 1764 crewmembers. The 303rd bomb group was active in the following campaigns: Pacific (427th squadron), European air offensive, Normandy, Northern France, Rhineland, Ardennes, Central Europe and EAME. On July 26, 1945 the 303rd bomb group was deactivated. In the 50's the 303rd bomb wing did service in the cold war. At the 25th of June 1943 the 303rd bomb group flew it's 67th mission, for Joe Palmer and his crew it was the 11th mission. The target was Hamburg, but due to bad sight over the target they could not drop their bombs. Instead they attacked targets of opportunity on the way back. On the way back Joe Palmer's plane got heavily damaged by German AA-fire and it eventually started to burn and crashed at Borgsweer The Netherlands. 7 men of a crew from 11 died, the other 4 survived but were taken prisoner. 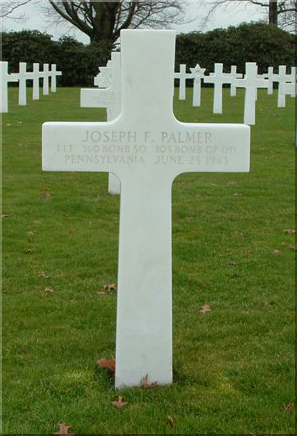 Joe Palmer was killed in this action, he was 23 years old. Crewlist of the "Avenger" on June 25, 1943. An eyewitness wrote a letter to the Owen family (Burl Owen was a Gunner at the Avenger) in 1946. In this letter she describes what she saw on the 25th of June 1943 at about 9AM. "There were planes coming from Germany, one plane was on fire and pieces of it fell off, the tail landed near our house. Then the plane crashed. At the crash-site we found 7 dead young men. The 2 in the cockpit were charred, the others were not burned, but they all had injuries to the head. Their parachutes were laying next to them, why didn't they jump? The next they were buried, the whole population of the village joined the mass." 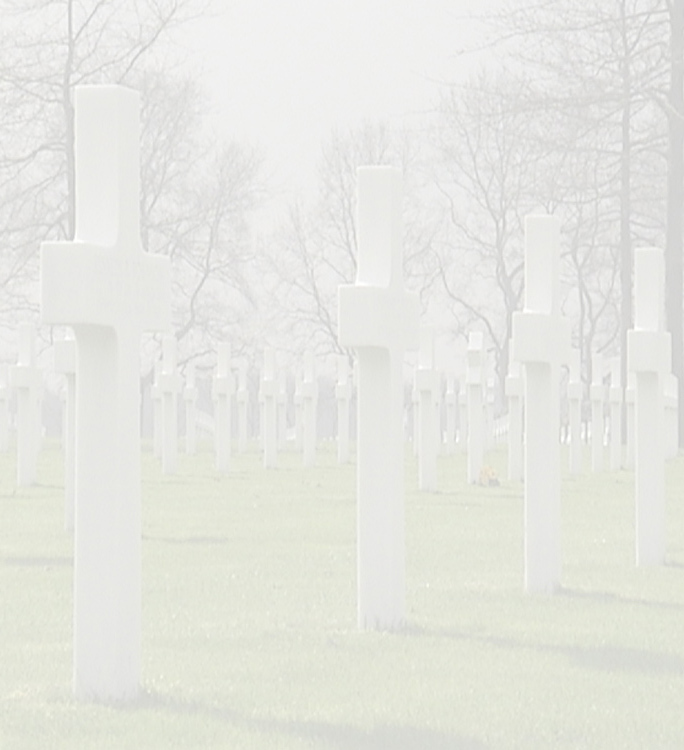 Later they were re-buried at the Margraten cemetery. Joe Palmer's brother Charles received a telegram from Joe after each mission:"chalk up number 5", "chalk up number 6" eventually there was "chalk up number 10", this was the last telegram he received. 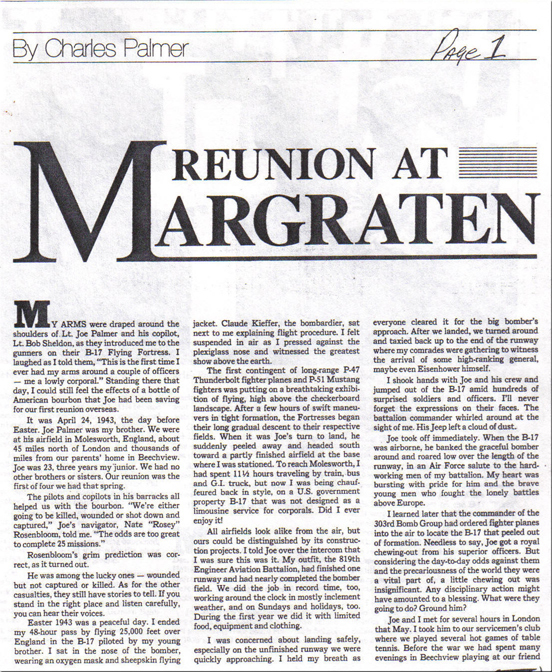 The following is an article written by Charles Palmer, Joe's brother. It's a touching piece in which he looks back at their meetings in England during WW2 while visiting Joe's grave in Margraten in 1987.